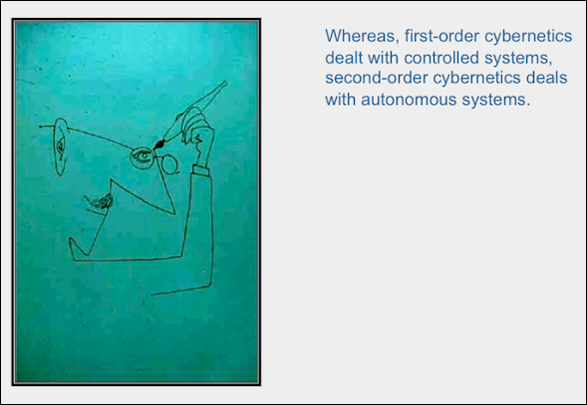 Cybernetics — from the Greek kybernētēs meaning “steersman” or “governor” — is famously difficult to define or describe. “The art and science of human understanding,” a definition proposed by Humberto Maturana, is among the dozens listed by the American Society for Cybernetics (ASC). “I don’t think cybernetics exists, it’s a conglomerate of some subjects which span across completely unrelated areas and it really isn’t treating anything in particular,” laments one Wikipedia contributor on the article’s talk page. 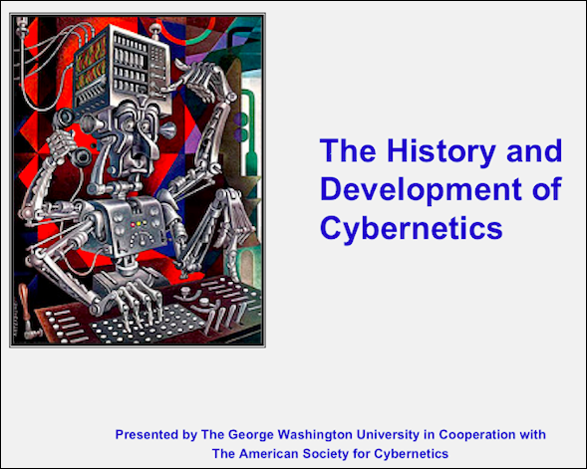 All said, even the thorniest of ideas have a developmental history, and I came across a charming slide show on “The History and Development of Cybernetics,” originally compiled back in 1982 by students of former ASC president Stuart Umpleby. The slides are available for download in ten languages here, and they run through java-enabled web browsers here. 1. In evaluating the potential contribution of the set of concepts that fall under the umbrella of cybernetics, one must decide if a “stable home” is desirable. It is precisely the absence of a stable home that continues to attract me to this continually changing conundrum and the questions it asks. 2. Cybernetics treats difference, change and complexity as phenomena in their own right, going beyond concepts of matter and energy to concepts of information and organization. The common threads that weave cybernetic ideas together have included and still include: circularity and recursion, dynamics and process, variety and constraint, observation and participation. Cybernetics asks not: Why does a phenomenon exist? But rather: Why is a behavior not currently possible, and what would it take to make it possible? 3. The value of cybernetics is in helping me to get what I want when what I want is not currently possible. “Why is a behavior not currently possible, and what would it take to make it possible?” It seems to me that this inquiry aligns closely with what I am pursuing on Solving for Pattern. At a glance, it looks like none of them are a close fit for the inquiry you describe. How might I better understand this fit? Are there antecedents for describing this inquiry in this way? Or is this description another indication of the “absence of a stable home”? I find some of these definitions/descriptions more useful than others, and some more useful at some times and others at other times–depending on the situation, the audience, the discipline, etc. 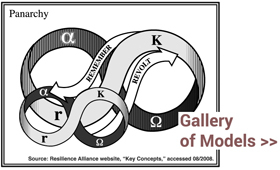 I work to keep cybernetics from becoming a discipline, one strategy for which is to resist any stable home for it. I want cybernetics to stand on its own, not as a subject, but as a process. Of the options available, I particularly like what Gregory Bateson (anthropology) wrote in “Cybernetic Explanation.” In addition to the canonical descriptions of cybernetics offered by Norbert Wiener (mathematics) and Ross Ashby (psychiatry), I like the spins put on it by Gordon Pask (learning and technology), Humberto Maturana (biology and cognition) and Herbert Brun (composition). Brun also spoke of cybernetics as “the science of compatibility and doability”. While I cannot vouch for all the definitions/descriptions listed, or the motivations of the definers/describers, the ones I tend to use all embed at least the four threads (circularity/recursion, dynamics/process, variety/constraint, observation/participation), what Klaus Krippendorff (design) refers to as the pillars of cybernetics (and others call cornerstones). I look at the list of definitions/descriptions as perspectives, and the more I can put myself into the mind of the definers/describers the more rich the vocabulary of cybernetics becomes. It is in the doing of it that I find value. If there is an antecedent, it is in those descriptions that mix science and art, with science seeking the coherent and art the desirable. Previous post: Local food systems: sustainability or resilience?